The year: 1992 – your host was 16 years old. The album: The Breeders POD. I can draw a line between certain albums in my formative years that connect to many of my listening habits and audio fetishes of today. A major landmark on this aural roadmap is without a doubt The Breeders 1990 debut POD. I had called myself a Pixies fan for a couple of years by the time I got around to this, Kim Deal’s then side-project, and was expecting a somewhat bigger sound. What I heard in it’s place went on to mold and define my tastes from then on out. At it’s core, Deal’s songwriting and Steve Albini’s engineering of the album burn slow throughout. Lo-fi pop/post-punk brilliance. Still ranks as one of my all-time favorite albums. Switching gears the re-tooled band (gone was Tanya Donnelly, replaced by Kim’s twin sister Kelley and the addition of a new drummer in Jim McPherson) released an excellent four song EP entitled Safari that showed off a slightly tighter sound more in line with that of The Breeders 1993 follow-up LP Last Splash. Revisionists history — Last Splash is amazing — even more so in retrospect. Containing the radio-friendly hit “Cannonball”, the album, while commercially well-received, unfairly got an early nineties alt-rock tag that it has yet to completely live down. Pop hooks from the underground, warm washes of feedback, amber tones and biting lyrics grace the entirety of the album.After the vinyl EP Head To Toe and the slight brush with fame via the success of Last Splash, Deal began hanging out with fellow Dayton, OH rockers Guided By Voices, even producing one of their albums. What also grew out of their relationship was the sound of Deal’s next band The Amps. 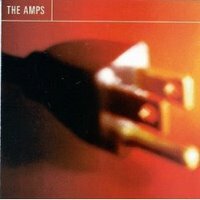 Super and subtle lo-fi, The Amps Pacer was a shock to even fans of POD. Note: I have just recently starting listening to this one again, as it’s timeless in it’s appeal and style. Fast forward to December of 2001 — LAX terminal at 5:00 a.m. 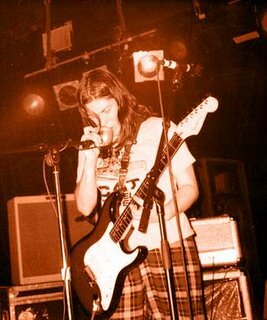 I am standing in line for coffee at McDonald’s waiting to catch a flight to Chicago when I look to my left and Kim Deal is standing next to me in line. I mumble something about being “a big fan,” blah blah, and she goes on to tell me she is flying to Chicago to cut a record with The Breeders at Steve Albini’s studio. You can imagine my groggy surprise at news from Deal herself that The Breeders would be re-uniting after a nine year hiatus. Hot damn.The album turned out to be 2002’s Title TK (which, by the way, is journalist-speak for “title to come“). Kim and Kelley together againbacked by members of old-school Los Angeles punk outfit FEAR as the rhythm section. Harder, more abrasive and the perfect follow-up to Pacer, Title TK confused fans of the lush summertime pop of Last Splash and in the same breath thrilled all of the old fans with it’s gritty backbone. Myself included.Here are some MP3 selections to gnaw on. If you haven’t already – spend some real quality time with Kim Deal’s ever evolving muse. Amazon: The Breeders – Title TK + Visit The Hype Machine for additional Breeders MP3s. + The Pixies available through eMusic’s 25 Free MP3 offer. Wow, what a great blog. I agree completely on Title TK – despite the lukewarm critical reception, it’s a hell of a grower and one of my favorite records of the decade. Great post, Drunkard. Do You Love Me Now? and their take on Happiness is a Warm Gun make me lightheaded. Hardly on par with shooting the breeze regarding on of her albums, but I am certain that she smiled at me at a Pixies concert.